Isn't it amazing how those of us who have a passion for this seem to never tire of anything involving a needle. I even resist going to sleep at times because I am so engrossed in whatever design I happen to be working on and I really resent needing to stop and go to bed. I do so many times reluctantly. When people ask me if I ever sleep I have a pet response - I never deprive myself of sleep or food - - probably should let that last item go a little but heck we only go around once. Over on the Online Mystery Classes side the Swans finally came swimming home. I am amazed that we have already gone through 7 of the 12 days! Time is moving so swiftly. 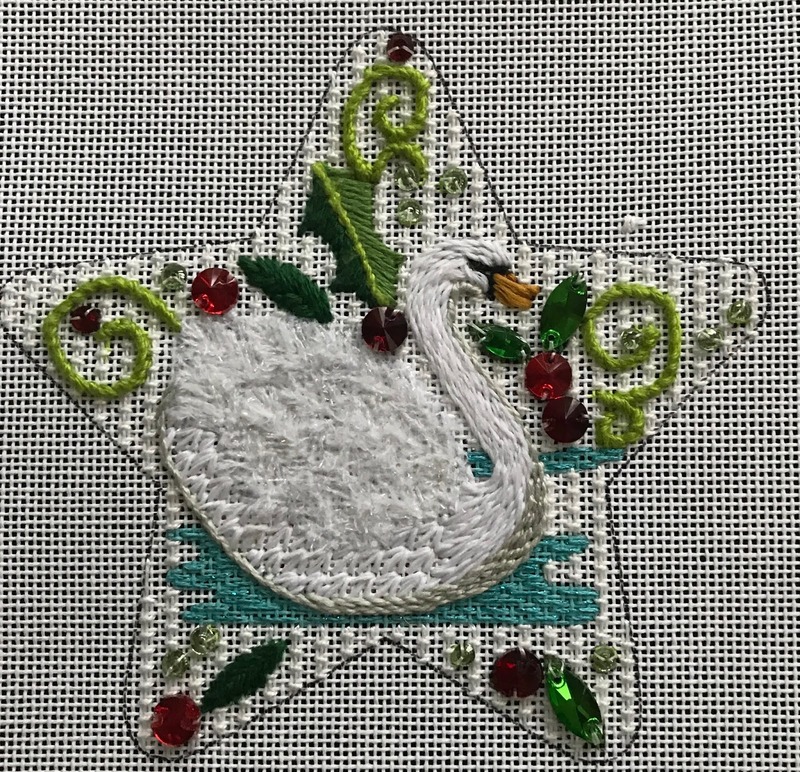 I'm leaving this week for a wonderful f2f Embellishment 4-day session at Stitcher's Garden in Naperville, IL. Several of my students from Designers Desk in Geneva, IL are coming over and it will be like a happy reunion. I'm anxious to meet several new stitchers to me also. Those who know me know that I always have fun so I'm ready for the challenge. After this excursion I'll be packing up for the ANG Seminar in Washington, DC. Kits are almost ready for that one and looking forward to seeing lots of familiar faces there too. You know, those events where you see some friends only once a year? This is that event for me. 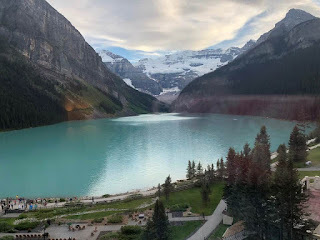 Be sure to come by even if you are not registered - there's lots of wonderful stuff to see at the Exhibit and of course you get to see the anxiously awaited reveal of the classes for 2019 ANG Seminar in Houston. I have three classes on display here - come see. And it is FREE! My next f2f class will be in Seattle, WA. 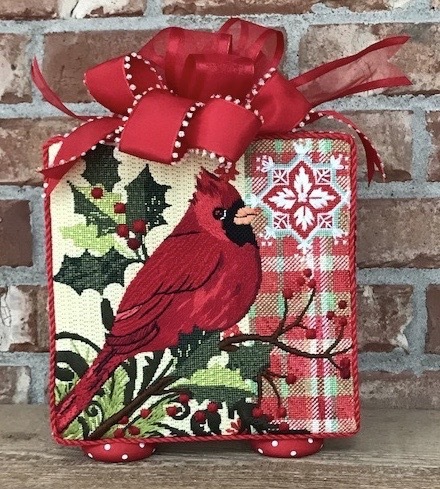 The SpaceNeedlers are hosting the beautiful Maggie piece that I have called Winter Cardinal. Registration has closed for this class. But - - - never fear! It will be a class at the ANG Seminar in Houston in August 2019. If you are not a member of ANG you can join now. There are so many options - a chapter if you are fortunate enough to have some in your area, a member-at-large (I think that is still a viable membership) and the ever popular CyberPointers. Go to the ANG website of needlepoint.org and check out the details. The next f2f class after Seattle will be in Houston as well. The Blue Bonnet Studios has such a wonderful array of teachers and class projects from which to choose. 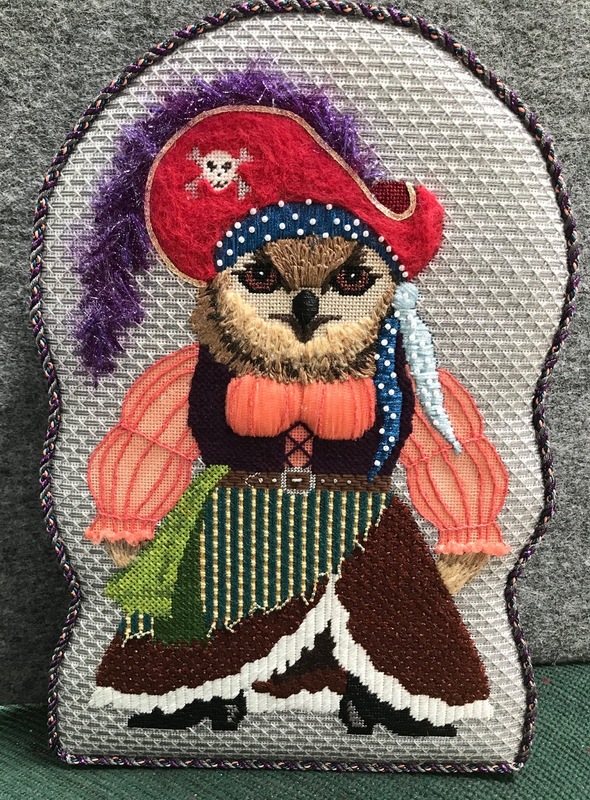 I am fortunate to be teaching Captain Blackbeak's Wench from JP Needlepoint. There are lots of interesting techniques in this exercise. 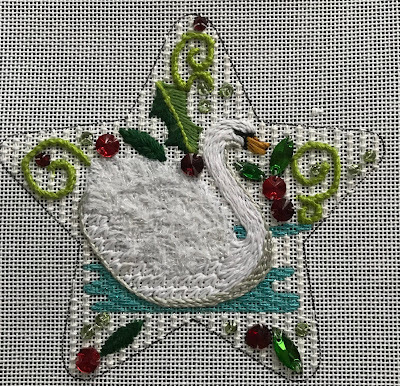 I think it is fun and I loved stitching her. Needle felting, thread manipulating, feather creation variation, padding and much more! Check out all the classes and receive registration form over at https://bluebonnetstudio.com/retreat-classes/. We'd love to have you join us. The Wench is a four-day class - February 17-20, 2019 in Houston, TX. Have you met her boyfriend? 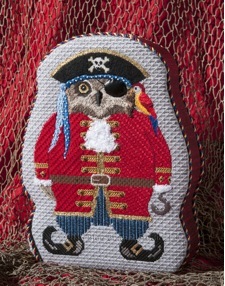 Captain Blackbeak? He is available through your LNS and there is a stitch guide for him as well on my website of duodesignsinc.com. This week I am concentrating on the class project for our Stitching Down the Danube riverboat stitching cruise. I really like how it is developing. I can't share pictures just yet. I would want to share them with the Cruise Participants first. Maybe I can have something next week - depends on what life throws me. Also working on exclusive design for the Canadian Rockies Train/Motor Coach stitching adventure. That is going to be so peaceful and serene - WOW! Just sit back and enjoy! Right? Contact our agent Liz at lwolak@vikingtvl.com for trip details. It is April 2019 - full brochure is in the files section on the left column of this page. That's it for this week! Have a great weekend and remember to Stitch with a Smile!